Hey, Tomato Pie fans! I’m finally getting my ample fanny in gear and linking up with What We’re Reading Wednesday, hosted by the lovely and talented Jessica at Housewifespice. 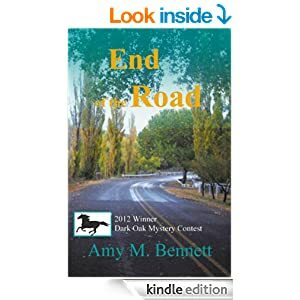 I just finished reading End of the Road by Amy M. Bennett. What a rip-roaring good time that was! What’s it about? Corrie Black, owner of the Black Horse Campground, hopes for a successful start to her summer season but the discovery of Marvin Landry, a long-time guest, shot dead in his own RV, along with $50,000 in cash missing, does not herald a good beginning… especially since the victim’s handicapped wife and angry stepson seem to have little interest in discovering who murdered him. Was Marvin’s murder planned or just convenient? And is the appearance of a mysterious biker with a shadowy past that includes a recently deceased wife merely a coincidence? Despite opposition from former flame, Sheriff Rick Sutton, Corrie is determined to find out who murdered her guest. But will she find out who is friend or foe before the murderer decides it’s the end of the road for Corrie? Want to know what I thought? It has been a LONG time since I read a book that made me literally laugh out loud! In Amy Bennett’s End of the Road, we have a cast of characters that that manages to be hilariously familiar yet fully dimensional. The plot of this cozy mystery kept me guessing up until the very end, kept me cheering for the heroine and the charming heroes who flanked her, and had me tearing through the fast-paced pages to find out what would happen next. All characters had clear motivations and believable flaws, and I got a clear sense of setting with just a few masterfully placed words, even though I’ve not been to New Mexico since I was a wee kid. With Amy Bennett’s End of the Road, reading is FUN again–lots of it. HIGHLY RECOMMENDED! All of you who’ve written me and told me that my book left you wanting tomato pie and other assorted Italian food? End of the Road had me baking blueberry muffins on a Sunday and wanting to try piñon coffee (revenge, it seems, is sweet when it’s literary and food-related). Guns ‘n’ Hoses. The WESTLAKES?!?!?! Hair the color of Kool-Aid. I’m not exaggerating: it was LOL funny and EOYS (edge of your seat–that’s a thing, right?) suspenseful. You want to buy yourself a copy now, don’t you? I also see that the second book in the series, No Lifeguard on Duty, just came out. I just may edge some things around on my dance card to read that one next. EOTR was just that good. 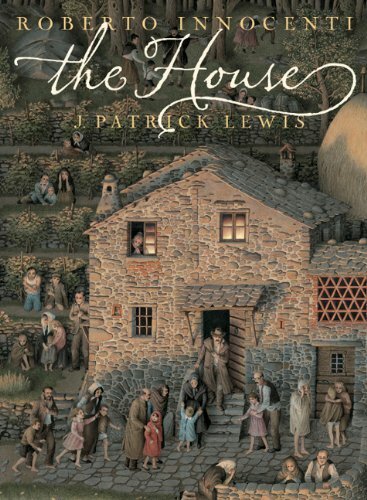 The House by J. Patrick Lewis and illustrated by Roberto Innocenti is a Charlotte Mason dream come true. In this lovely book we watch the rise and fall of the 20th century through the eyes of a house in the Italian countryside. Lewis’s quatrains both tantalize and humanize the memories of our book learning, but they also give children even as young as my four year old a jumping-off point to ask questions about the century they have yet to meet through study. The illustrations are rich with nature study, history, anthropology, family life, and much, much more. Here’s another book I wish Amazon would let me give six stars. Highly recommended for all ages. I love the title of your blog. I have never had tomato pie, though I recently bought the very special and expensive San Marzano? canned tomatoes to make it. I also love a good EOYS mystery! Thanks for the two book recommendations. Have you read The Spellman Files by Lisa Lutz? Very funny mysteries. I shall have to check out The Spellman Files. Who can resist a character described as “addicted to Get Smart reruns”? Seems I can’t! Thanks muchly for the rec.